We had our grading again today. As always, every student did really, really well. I always get inspired watching everybody grade, particularly when I know beforehand the obstacles each students needs to overcome. Today was one of those days. Without mentioning names, I know of a few students (adult and children) who approached this grading with “trepidation”. Some of the students were really shy and do not like performing in a group situation. Some of the students were really nervous…even fearful… just before the grading (more so than most others). Some of the students, although I think they have good technique, sometimes perform within themselves, as if they do not have the confidence to show how strong they really are. With each of these students, I wanted to pull them aside before grading to let them know that everything will be fine (which I normally do). However, this time I refrained. Having personally felt low self-confidence throughout life, I know that sometimes it does not matter what anybody else tells you. Sometimes, you just need to go out and conquer those demons yourself. As this was a martial arts grading, this would be my little test for those individuals. Demonstrating your technique – once the ancient Samurai drew their sword, it was a fight to the end. If the Samurai did not want to do that, then they had to keep the sword in the scabbard. It is the same when you raise your fists. You cannot be casual about this. When you raise your fists, the choice to fight has been taken away from you. This is the same as grading. The second you raise your fists in grading, your choices have been taken away from you and you must perform what is requested of you. There is no looking back. And when you can do this under pressure, it will increase your confidence over time. You can then carry this confidence into every other area of your life. Gradings…and martial arts for that matter…should be used as a canvas for life. It would also be remiss of me not to mention the wonderful community and fantastic trainers who help the students through the grading. When things get hard, it is golden to have people supporting you. Often in life, you cannot see what is right in front of you. Sometimes, you cannot see the strong and confident person that you are. However, others can see it. Your martial arts trainers can definitely see it. That is why they will never stop encouraging you to become the best you can be. With this level of support, how can it not help you to build your confidence? Long story short, each of those students who had confidence issues passed with flying colours. It is OK to be fearful before doing something that is really important to you. However, you cannot let those fears overcome you, otherwise you will not become all you can be in life. Furthermore, I could not help but wonder how the confidence of setting a goal…and then achieving that goal…would then carry through to every other area of life. Imagine the confidence that person has next time that encounter a challenge. They will be that little bit more confident, and then even more confident when they stand up to the next challenge. What a wonderful gift that is. I would love to hear stories of how you feel that martial arts has helped increase your confidence in other areas of your life. 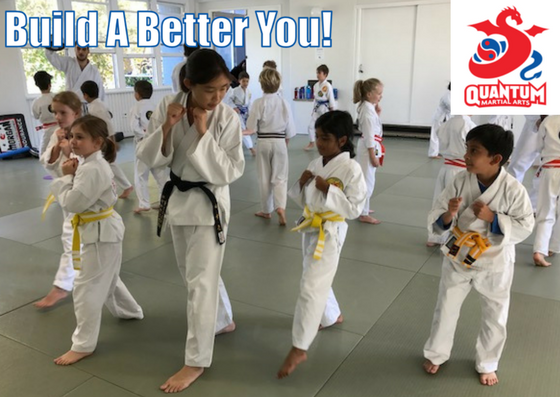 Please leave comments or email me on info@quantummartialarts.com.au. I love hearing real-life inspirational stories, particularly from people who I know personally. p.s. My wife, Bet, does not do martial arts, however was helping work the door at grading. It is funny how when people have fears, they will sometimes tell a friendly stranger, as they must feel that the stranger is neutral. Bet got a number of people revealing their fears prior to grading. Oddly enough, these were the same people I had in mind throughout this blog. Bet made a point of watching these people throughout their grading to see how they would go. Bet felt that these people were superstars, they had nothing to worry about and that they really inspired her. It was all Bet spoke about over dinner. The point here is to never let low self-confidence stop you from doing what you really want to do. While you may have self-doubt, you may be secretly inspiring others without even knowing it. If you enjoyed reading this article please like and share using the buttons below. We would love any comments or feedback! Thanks!